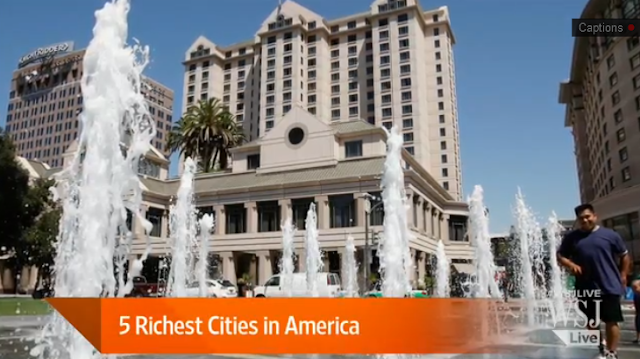 You will have to hit the source link for the video, but San Jose was named the Richest City in America. There were some shots of Downtown both at the beginning and the end of the video. What do they attribute San Jose's success to? Tech, tech, and more tech. The #2 wealthiest city was Washington, D.C., followed by Bridgeport, CT in 3rd. San Francisco came in 4th while Boston rounded out the top 5. And in related news..."In a detailed report released by the U.S. Department of Housing and Urban Development, San Jose/Santa Clara County posted the nation's fifth-highest homeless population. It also ranked among the places with the most chronically homeless and homeless children and young adults." Thanks, will break out a Saturday Stat for this in the future. What's your point Anon? Where do you think do Anchorage or Fargo rank in this "report"? Proudly displaying how rich you are when there a tons of poor people around is distasteful. And who cares whether San Jose is the richest? Other stats that Josh posts a la healthiest, cleanest etc are thing to take pride in. Richest? I dont know..
Had the WSJ report rank us as the poorest city in the USA, you'd probably point out that we have the country's highest population of millionaires and call it "appalling". "Man spends his life in reasoning on the past, in complaining of the present, in fearing future."